The Garden Tower is the next revolution in urban gardening. This 100% American-made product can help you grow anything anywhere, but, most importantly, the food will be CLEAN. With The Garden Tower you can grow as much as 50 plants in a surface of no more than 4 square feet! It’s ideal for small yards or even balconies and terraces in the city. This innovative system requires such a small surface because it allows you to grow plants vertically (6 Levels, 43" Tall x 25" Wide). If most container gardens currently available on the market only allow you to plant on top, Garden Tower’s innovative design features 45 openings around the outside and enough space to grow five tall plants on top. Your bountiful harvest can be completed by the side pockets where you can plant compact root vegetables (radishes, turnip, carrots and so on). Even more, Garden Tower is self-fertilizing. 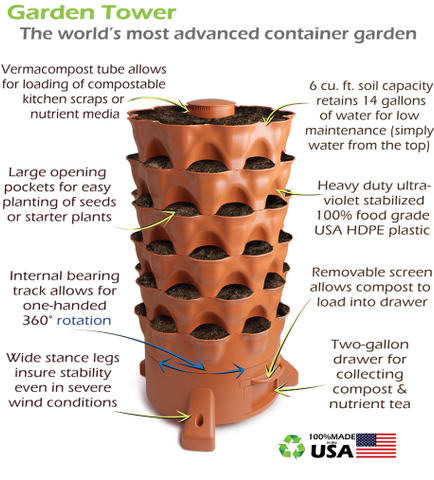 The tube that runs through the middle of the Garden Tower is actually a patented vertical vermicomposting system. The principle is quite simple and very effective: at the beginning of the growing season, you need to add a cup of worms in the tube. Then, instead of throwing away your kitchen vegetable scraps, add them to the tube. The worms will feed on it and turn it into organic manure that will, in turn, help your plants grow faster. 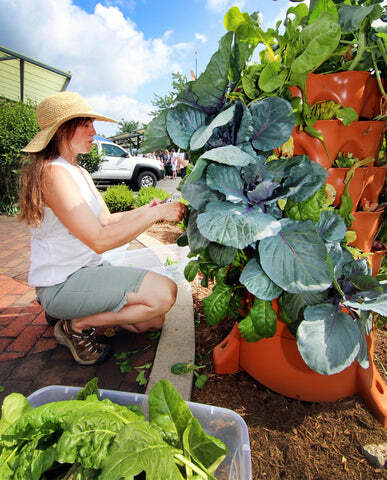 For success in the Garden Tower System, good soil is critical. Using a quality organic “professional potting” soil or mix, meant for containers is essential. A good commercial organic potting soil (or “grower’s mix”) will optimize drainage, water retention, and aeration for both plants and the compost. Plus, you will only have to water it seldom; due to its unique design, it recycles the water you add and exposes very little soil to the sun. You need no electricity or expensive accessories to grow your ORGANIC, CLEAN and HEALTHY FOOD ANYWHERE. The Garden Tower, soil and seeds are all you need! Check Garden Tower videos below. Garden Tower comes with a 5-year manufacturer’s warranty against defective parts. Explore More About Garden Tower Now!